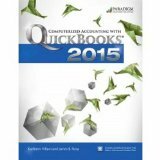 Computerized Accounting with QuickBooks#65533; 2015 teaches both the accountant and non-accountant student how to use QuickBooks 2015, one of the most popular general ledger software packages available. Through detailed step-by-step explanations and hands-on exercises, students get ample practice opportunities to ensure mastery of the accounting concepts. Students will: Receive immediate reinforcement of accounting concepts and apply their skills through practice exercises. Learn what to do and why through a practical, effective, building-block approach.